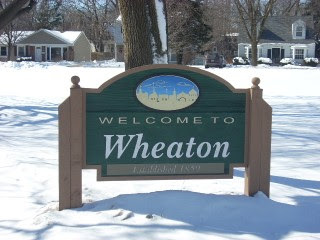 Wheaton is located about 25 miles west of Chicago and Lake Michigan. As of the 2000 census, the city had a total population of 55,416. The city has a total area of 11.3 square miles. The city dates its founding to land claims made in 1837 and 1838 by Erastus Gary and two Wheaton brothers, Jesse and Warren. A plat for the city was filed with the county in 1853. The brothers led a successful campaign in 1867 to make Wheaton the county seat. The village is bordered by Carol Stream and Glendale Heights to the north, Glen Ellyn to the east, Naperville and Lisle to the south, and Winfield to the west. Wheaton is the seat of DuPage County, one of the most affluent, fastest growing counties in the United States. The city is located in close proximity to I-88 and I-355. There is a Metra rail line with a station in downtown Wheaton. O'Hare International Airport is approximately 15 miles from the village. According to data from the Northern Illinois MLS there were 476 sales of single family homes in 2007, down from 517 in 2006. The average sales price was $433,148.00, this was a slight decrease from $433,4642.00 in 2006. Marketing times were an average of 121 days on the market, up from the 2006 average of 89 days. As of February 17, 2008 there are 367 active listings of single family detached homes in the MLS. At the 2007 level of absorption this is 9.21 months of unsold available inventory. A 3-4 months supply of inventory is considered "in balance", this level is an oversupply. To recap 2007 for detached homes, sales volume was down -7.54%, average sales prices were down only -0.07% and are considered stable, and the days on the market were up +35.95%. This market is oversupplied and the 367 active listings have already been on the market an average of 220 days. The condo/townhouse market had 221 sales, down from the 245 properties that sold in 2006. Sales prices saw a decrease with the average 2007 sales price at $213,845.00, compared to $216,775.00 in 2006. Marketing times were an average of 83 days on the market, an increase from the 2006 average of 65 days. There are 130 active listings of attached homes in the MLS. Based on the 2007 level of absorption this is 7.06 months of unsold inventory. The condo/townhouse market is over supplied, sales volume was down -9.79%, average sales price decreased -1.35%, the days on the market increased +27.69%. The 130 active MLS listings have already been on the market an average of 192 days. This is a wonderful assessment of the Wheaton market. There is plenty of inventory out there with higher than average market times. However, home prices have plateau - not great news, but much better than some parts of the US. Thanks for your comment. Too much inventory is the problem all over the Chicagoland market at this time.